Any television show or movie that idealizes life in the home-kitchen will show a few basic things on the counters. Most likely an electric or two, like a toaster or mixer, and usually a set of graduating canisters in which the basics of baking are stored – brown sugar, granulated sugar, and always ,in the largest one, flour. That makes sense, right? Flour is a staple ingredient in cooking – both savory and sweet – it helps us make everything from breads to cakes to an aid in thickening sauces. When I think of flour I always think of the Movie Stranger Than Fiction, where the woman (a baker) is presented with a box of “flours” to convince her to go on a date with the man. I always thought that was such a cute idea. Not to mention, very useful. Let’s delve into the world of flour and learn about what it is, understand gluten, and figure out which kind to to use with what you’re making! Flour is a powder that is made by finely grinding grains, nuts, seeds, or roots. It is used in almost every culture in one way or another, primarily to create some form of bread or pastry. Flour is one of the most well-known and popular staple ingredients around the world. There are many different foods that can be ground to make flour, but most western flours are made from wheat. 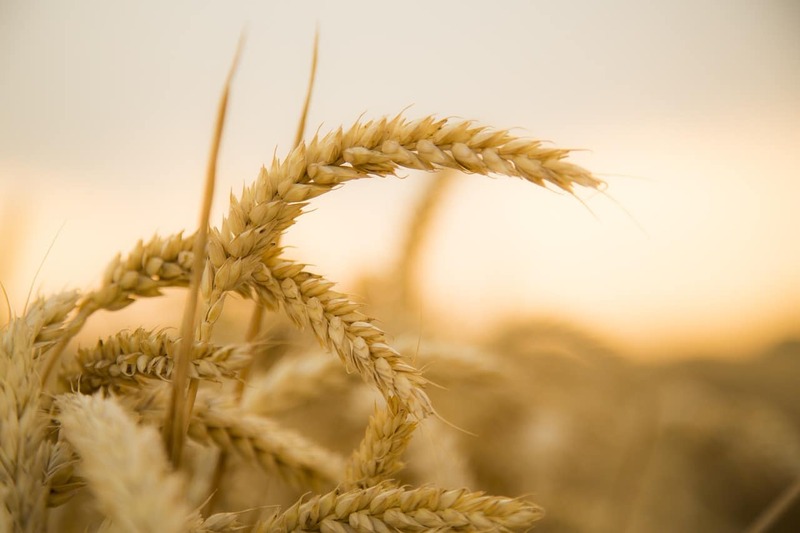 The rise of celiac disease and gluten-free diets, however, have encouraged a larger production of flours made from other grains such as rice, quinoa, or oats, and they are becoming much more easily available for purchase. Bran. The bran is the outer hull of the wheat and the primary source of fiber in flour. I’m sure you’re familiar with bran muffins, right? Endosperm. The endosperm is the middle of the wheat. This is the largest part of the wheat kernel and is the only part used when milling white flours. Germ. The germ is the inside of the kernel and is the part that contains fat. What does protein and gluten in flour do? 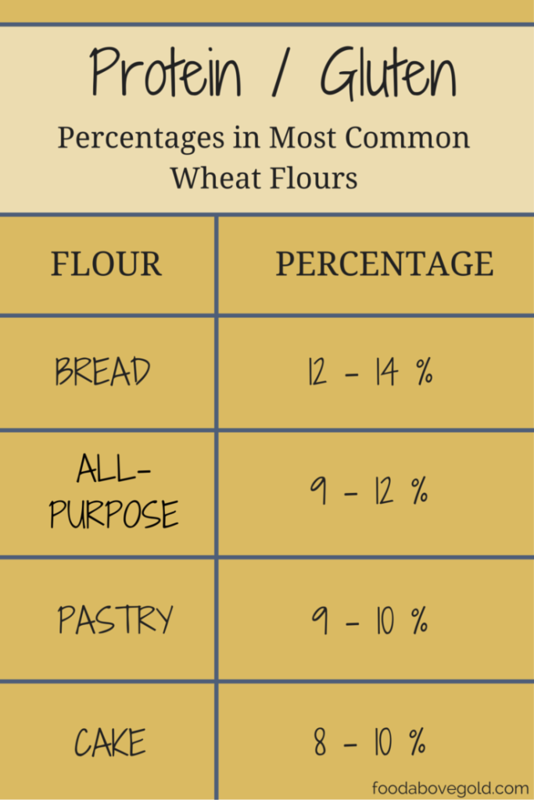 Depending on the type of flour you are using your protein amounts will vary, and the amount of protein in your flour determines how much gluten you will be able to produce. In a nutshell, they go hand in hand. The higher the amount of protein, the stronger the gluten. Have you ever been rolling out a dough and it keeps shrinking back to a smaller size, no matter how much you roll it? That is gluten at work! Gluten in your flour is what creates elasticity and stretch in the food you are making. It activates when mixed with water and develops during kneading to create a web that is capable of trapping the gasses let out by leavening agents, like yeast or baking powder. If shrinking dough is a problem you come across often, relaxing the dough and letting it rest for a little bit will solve the problem. It is important to understand gluten’s role in your flours so you can best choose what type of flour to use. The higher the gluten amount the better the food will hold its shape, but will require yeast or another leavening to rise. The lesser the gluten amount, the more delicate and crumbly your mixture will be. All Purpose. Also known as AP flour, all-purpose flour is your middle of the road, medium-gluten, good for anything flour. It is made of wheat that has had the germ and the bran removed, milling only the endosperm. This makes the flour ideal for a home kitchen – it is useful for making a roux, light pastries, and hearty breads. There are two varieties widely available. Unbleached. This is an untreated flour. While not as bright as bleached flour, unbleached flour has a slightly off-white color. Bleached. Don’t worry, there is no actual bleach used to whiten this kind of flour, but there are a few different kinds of chemicals that may be used to achieve the same goal – such as, benzoyl peroxide (yes, the stuff that is often the active ingredient in acne medication), or chlorine gas. The primary reason for choosing bleached flour is if you are making an item that you want to have a white color. Self-Rising. Self-rising flour is bleached, all-purpose flour that has baking powder and salt added to it. Many older recipes will call specifically for it, but rarely do you find modern ones that do. The benefit of purchasing self-rising flour is that in the process of blending it, the baking powder and salt get evenly distributed. You can achieve almost the same result at home with a good sifter, but it would take a little time. Keep in mind that the longer that anything is stored, or exposed to air, the less effective it becomes – so if you don’t use this kind of flour often, the self-rising properties will begin to lessen over time. Whole Wheat. Whole wheat flour is made by milling the entire kernel of a red wheat berry. Since whole wheat flour has the germ, and the germ is higher in fat than the rest of the grain, remember that there is a risk of the flour going rancid. While whole wheat flour is more than strong enough to stand on its own as a bread dough, it is often cut with all-purpose (or another) flour to help make the final product more palatable and less dense. White Whole Wheat Flour. I know this seems a little oxymoronic, but this is a type of whole wheat flour that comes from a white wheat berry instead of a red wheat berry – hence, the name. White wheat berries tend to be a little more delicate and supple, so it is easier to substitute this kind of whole wheat flour into things like cookies, brownies (things that you would normally use AP flour with) without it being as obvious as standard whole wheat flour. Bread. Bread flour is a high-protein flour used to make hearty breads, rolls, and pizza doughs. Due to the stronger gluten,when you knead the dough it creates a web that is better able to hold the expanding gas bubbles caused by yeast – which gives it that desirable texture and a stronger rise. If you were to use yeast on a a flour lighter than all-purpose, the gas bubbles from the yeast would break through the dough before it could rise. Pastry. Pastry flour is lighter than all-purpose and bread, but stronger than cake. It is ideal for muffins, biscuits, cookies, etc… You want to use pastry flour when you desire a light (but not airy) product that is usually leavened using baking soda/powder. It is still strong enough to bind together the baked goods, without making them overly chewy. This flour is prone to clumping, so make sure to run it through a sifter before use. Cake. Cake flour is the lightest of the basic flours, with the least amount of protein. Cake flour is best used for things that are dainty, such as fine cakes, or light and delicate cookies. It usually comes whiter in color because, like bleached flour, it is usually chlorinated, which helps reduce the protein content. All-purpose is the one that most home kitchens keep stocked, and if you’re trying to be healthy, you probably have some version of whole wheat in your pantry, as well. There are many different kinds of flour, and which one you pick should be decided by what you are making, as well as the amount of protein you want what you’re making to have. Gluten-free flours. What are they and how do they work? Gluten-free flours are flours that are made from grains that do not have glutenous proteins in the endosperm. Great examples of these are chickpea, rice, corn, buckwheat, or millet, among others. One of my favorite things about gluten-free flours is that all gluten-free flours are whole grain, so there isn’t any weighing of which is more likely to get the job done – you just get which kind you want. The downside to gluten-free flours is that it gives a different texture that some people find off-putting, and since they lack gluten, they do not get the same elasticity, making them more fragile. How do I measure flour? I know this seems like a silly question, but there is a quick distinction I would like to make. Baking is a type of chemistry, so in the professional baking world, flour (as well as pretty much every other ingredient) is weighed. All flour is capable of being compacted down into a measuring cup (like packed brown sugar), but when recipes call for one cup of flour, they intend for you to scoop the cup to overflowing and level off the top of it with a straight edge, such as the back of a butter knife. You may, on occasion, find a recipe that calls for a packed cup of flour, but it is rare. How should I store flour? 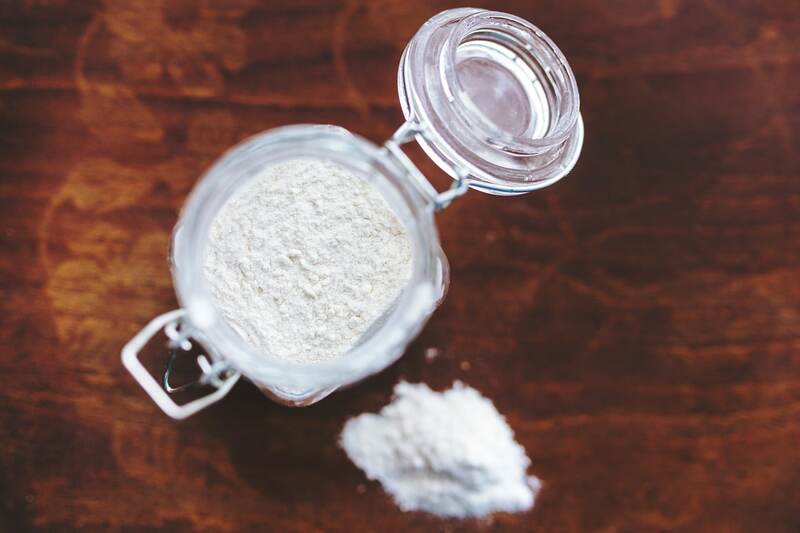 There are a few things to keep in mind when storing flour. Buy (or better yet, mill) only what you need. While buying in bulk might seem like a good idea, the longer the flour sits, the less useful it becomes. Remember, it is a fine powder that swells when exposed to water – so if your house becomes particularly humid one day, your flour is likely to pick up some of the condensation in the air, which, in turn, changes the way it interacts with other ingredients during baking. Also, flour tends to pick up the flavors of the things around it – which brings us to the next point. Air-tight is best. Get rid of the paper sack that it comes in and put it down in an air-tight bag or jar with a hermetic seal for safe keeping. Tuck it away. As visually pleasing as it may be to have your flour in a clear jar on the counter, just like with spices, flour is best stored in a cool, dark place. The less exposure it has to sunlight the better the chance that it won’t spoil or go rancid. The chances of this are higher in whole wheat flours. If you need to, you can even store it in the refrigerator to help prolong shelf-life – but remember the air-tight container so it doesn’t pick up other flavors. Expiration. Flour, like pretty much all foods, comes with an expiration, or “best if used by” date. 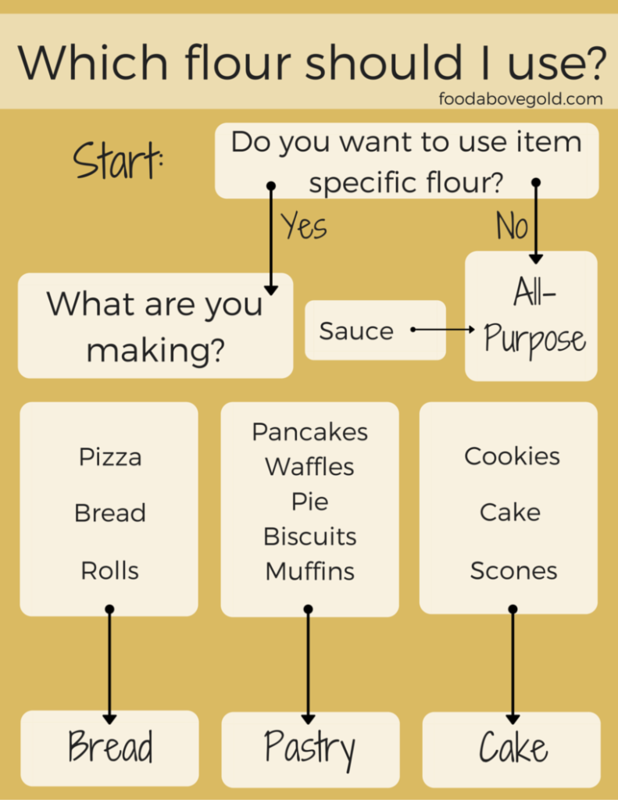 Keep this in mind when choosing how much flour you are going to purchase. Usually, flour can last about 6 months after the best used by date if it is stored properly and not gone rancid. I know that was a lot of information to throw at you, but now you know when to use the different kinds of flour – which trust me, will make everyone wonder what the secret is to your delicious and perfectly textured baked goods! You will be the hit of your next cookie exchange! I’d love to hear about which flours you keep in your pantry! Tell me in the comments!